I’m sure anyone who has a garden this time of year has the same issues as we do here at the Star of Texas Bed & Breakfast, an abundance of vegetables that will go bad if not used soon! You think “Oh, I’ll just plant these 3 zucchini plants, 4 tomato plants, 2 squash and lets throw in some herbs to go with it. That will produce enough veggies, right?” Well. I think we could probably do just fine with one of each! Too bad this year we also had an abundance of grass hoppers that quickly ate away all our squash and zucchini plants. So, with the few zucchini we had left, I have been experimenting with different zucchini recipes. 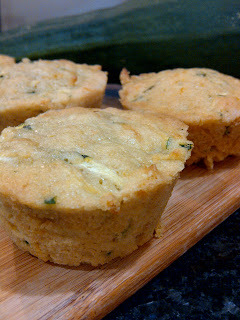 I’ve made Zucchini and Squash Gratin (mmm… delicious cheesy goodness), Zucchini Chips (which were great with our butterfly shrimp and Longhorn steak kabobs a few nights ago) and for guests I made Lemon Rosemary Zucchini Muffins (recipe to follow). I thought they were delicious. I think most muffins are delicious as long as they are moist. The more savory the better. Unless of course you are going for a sweet muffin, then the more sugar the better! When you come stay with us during the week, I try to have something fun, fresh and fanciful for your breakfast that is delivered right to your room. Geez, you don’t even have to get out of your jammies. I sure don’t! (One of the perks of cooking breakfast and not delivering!) I am posting 2 recipes today. One is the muffins. The other is not really a recipe. More an explanation of what I made for breakfast this morning. I suppose I should name it. How about Baked Eggs al a Becca! or something less cheesy. Because it wasn’t very cheesy. Although we do serve lots of cheesy things, because let’s face it, cheese is delicious. Ok, on with the recipes! Wait.. I have to tell you, I have been getting recipes from this website I found called punchfork.com. I may just be out of the loop and everyone else may already know about it, but if you don’t… check it out. It’s amazing! Preheat oven to 350F. Prepare pans (muffin, bread, etc.. ) with a coating spray or whatever your secret non-stick product is. I won’t share mine just yet. Sorry. Whisk eggs until frothy. Whisk in sugar. Whisk in melted butter and olive oil. Stir in lemon zest and zucchini. Now I like to use a separate bowl and add 1/3 of the dry mix, then mix in 1/2 of the wet, then 1/3 of the dry then the other 1/2 of the wet and then the last 1/3 of the dry. I guess I could have just said to alternate dry and wet, starting and ending with dry. But that wouldn’t have been as much fun for you to read, now would it? Put into prepared pans. Bake for awhile. It will vary depending on what kind of pan you have. Muffins usually take around 20 minutes, where loaf pans take almost an hour. So, just check it. I have decided that when I start to smell what I’m baking pretty heavy in the house, then it’s almost done. When you press gently on the top, it should bounce back. At least that’s what they say. I’ve never seen any baked good “bounce”. Video it for me if it does. That would be something to see. Celtic Sea Salt….. that’s what I used. You can use any salt. Sea salt is way better than table salt though. Especially the Celtic kind. Oh.. and Feta cheese. mm. mm. So.. I used a cool little tart pan that had a removable bottom (like a cheese cake mold I suppose). I greased it with my special grease. That sounds kind of gross. With my special “cake release”. That’s better. I rolled out the puff pastry, trimmed it to fit in pan. Make sure to press into pan so you get the cool design on the edges. Add 2 eggs… just crack ’em right into it, as to not split the yolk. Sprinkle some regular sea salt on the eggs. Bake at 350F for a little bit to set the eggs. Pull them out and add the tomatoes, zucchini and feta on top. Bake awhile longer until the eggs are cooked through.. maybe 20 minutes total baking time. Maybe 30. Just watch it. I’m super bad about timing stuff, if you can’t tell. I’d rather sit in front of the hot gas oven constantly opening and checking and losing heat, because that’s how I am. I believe it’s why I have such good skin. All the steam from opening ovens. Who needs a sauna when you have a kitchen!? After they are done, top with tarragon, basil and Celtic sea salt. I added a few puff pasty stars that I baked at the same time for presentation. It’s all about the presentation. Super easy! Don’t you want to come stay with us?